Ever wanted to journey back through the ages to ancient China, and be back in time for tea? Well, with the Fei Long Zai Tain slot from Playtech, you can. Join us as we discover just what makes this quest across the land of dragons so special, and potentially lucrative. It’s a five-reel game with three rows of symbols, and gorgeously decadent graphics. Fei Long Zai Tain also offers one of the juiciest bonus features out there – a maximum of 25 free spins with a colossal 15x multiplier. This can make for some dizzying returns! Fei Long Zai Tain is a chilled slot to pass some time on. Swirling dragons, entrancing traditional music, twittering birdsong, and rolling cloud imagery all make this one a joy to play. Options to set both the value of coins, and the number of coins bet per line. This makes for a huge combination of potential bet sizes. Twenty-five pay lines make for a substantial number of chances to win big when set to the upper limit. Prizes seem to be weighted towards the larger end of the scale. Of course, this is great if you’re running hot. Not so good when you keep spinning in blanks, however. There is only one bonus round. It is a potentially huge one, but still, some additional variety wouldn’t go amiss. The symbols for Fei Long Zai Tain all draw on ancient China for inspiration. There’s bamboo, koi carp, Chinese handicrafts, a phoenix, and a golden frog, and they’re joined by a lucky number 8, and elemental symbols. There’s water (水), earth (土), wood (木), fire (火) and gold (金). Both the phoenix, and golden frog offer returns of 750 coins, with Koi, the craftwork, bamboo, and the lucky number eight returning 400, 250, 250, and 150 respectively. The impressive stacked wild feature is represented by an animated dragon swirling in a figure of eight. Hit this five times across any win line, and you’re in for a massive 10,000 coin pay out. Without a doubt, the best feature of Fei Long Zai Tain is its bonus round. Typically, free spin bonuses offer 2-5x multipliers. Here, we’re transported into the sky by one of the mythical beasts and invited to uncover prizes from within dragon pearls. 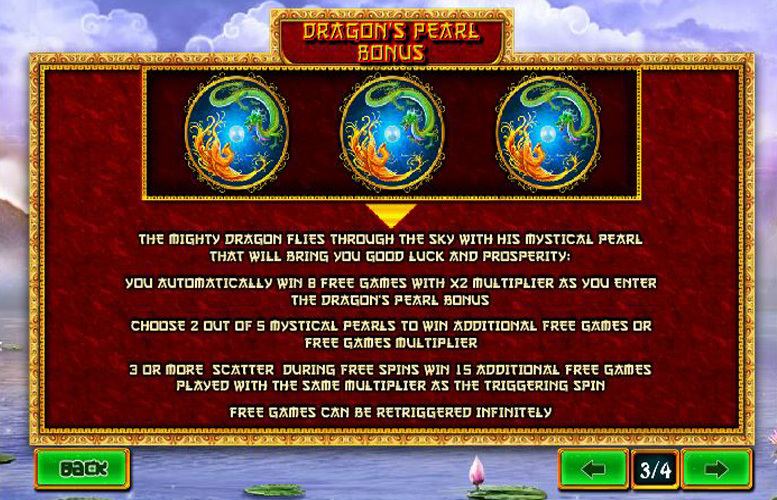 The default number of free spins awarded just by reaching the Dragon’s Pearl Bonus stage is eight with a x2 multiplier. Some dragon pearls have been known to contain up to 25 free spins, and a massive x15 multiplier. This can result in some massive wins. 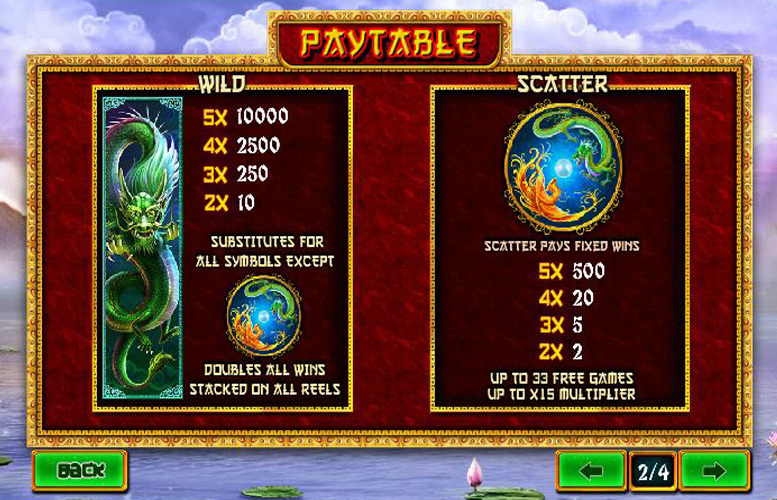 To activate the Dragon’s Pearl bonus, you must land three scatter symbols on any reels. These symbols are represented by a green, and yellow dragon chasing each other against a sky-blue background. It’s resemblance of a yin yang symbol is surely intentional. As we’ve mentioned, the juiciest pay outs come from the special symbols. However, there are additional pay outs to be enjoyed. These are represented by Chinese symbols representing the elements, and one meaning “gold”. Five-of-a-kind pays out at 150x the coin value for the gold symbol, and 100x the coin value for any other elemental symbol. 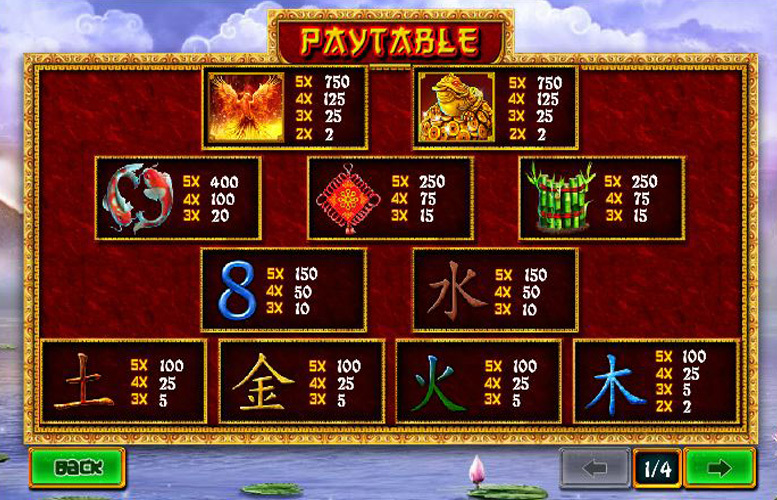 Certainly, one of the best things about the Fai Long Zai Tain slot is the number of different combinations of potential bets you can place across the reels. Being able to adjust the number of active pay lines, the number of coins bet per pay line, and the value of each coin makes for a whole lot of variation. 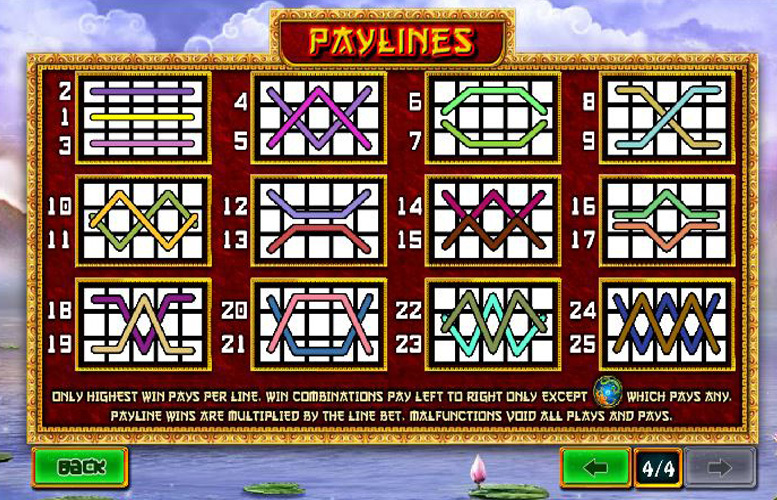 You can have up to 25 different pay lines active, and can choose between one and ten coins to bet per line. With everything set to the absolute minimum, you can wage as little as 1p, and with it all maxed out you’ll be forking out £1,250 per spin. 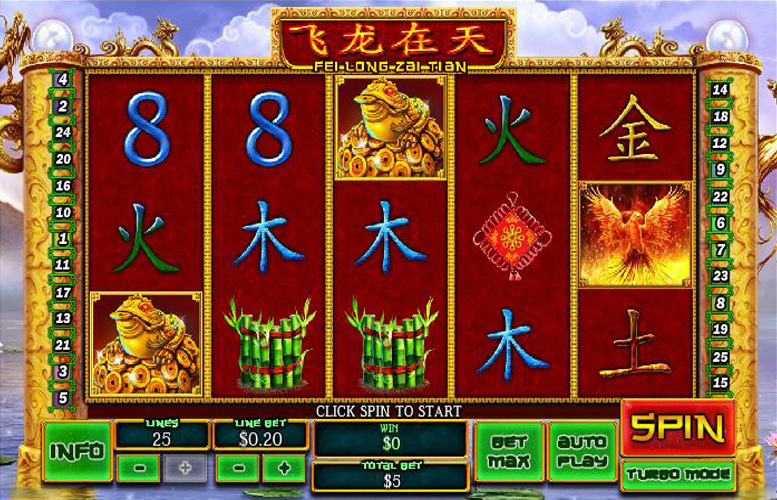 Fei Long Zai Tain is a straightforward enough game to get to grips with, and has potential for some massive pay outs. Stylistically, it’s a treat for the senses but beware of losing track of your bankroll amid the calming music, and soaring dragons. It’s a high variance machine that seems to pay huge, or not at all. Get lucky on the Dragon Bonus round, however, and every payment seems to trigger the “Big” or “Mega” win animation. If you’re a fan of “go big, or go home” style games, with great graphics, and character, this one could be for you. This game has a rating of 4 / 5 with 691 total reviews by the users.